Every Thursday we talk to the owner of a company to get to know them and their brand a little better! We have five questions we ask of each mom-preneuer. This week, we talked to Chandra, the owner and founder of Drink Chia. 1. What inspired you to create Drink Chia? 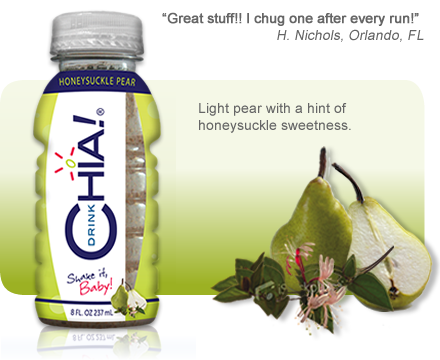 I was created Drink Chia selfishly at first for myself when I was training for my first marathon. I was really dismayed when reading the nutritional panels of sports and "healthy" beverages in the marketplace. The amount of sugar, calories and ingredients I couldn't pronounce was shocking to me. My two boys, 9 and 5, were my inspiration for taking Drink Chia to the marketplace. They loved it and I thought "I love giving them a beverage that doesn't contain artificial, neon colored ingredients that is low in sugar, calories and high in Omega-3 for their growing bodies." I figured other moms would have the same dilemma I did and hopefully would welcome Drink Chia as an option for their families. I had a lightbulb moment earlier this year that I can't give my time equally to everything each day. So I work really hard on quality time and don't beat myself up anymore if I'm not giving equal time to both buckets. If I am able to have 2 hours of time with my family each day, I put the iPhone/computer down and just really work on being present for those two hours. I realized too I can be with my family all day but my head is in work and that is not quality time with them. 4. Who has inspired you most in creating Drink Chia? The only way Drink Chia came to life was having an amazing partners Mark and Gideon and adding our other teams members like Ronni, head of business development to our circle. They inspire me everyday! We also are inspired our consumers that we like to think of as friends who are thankful that we have created this product line. Honestly, every morning that my boys ask me to make sure there is a Drink Chia in their lunch is still the coolest thing ever! 5. Is there any exciting news about Drink Chia you want to share? We'll start launching Drink Chia into different regions of Whole Foods by January 2013 and we have other products in development that I can't wait to share with everyone (still under wraps right now). Back in August, we tried Drink Chia for ourselves and loved it. You can read our review HERE. What a great idea for a post! I have heard of Drink Chia but had no clue a mom created it! And I agree, I will not let my son have drinks that are just junk with high sugar and artificial ingredients! This sounds great! What a great interview. I always try to surround myself with optimistic people. I think that is fantastic advice. I've never had this product but I'll give it a try in the future. Sounds like a great product. I did not know of this brand until now. I may have to give it a try. That is a great idea. I love getting to know more about the people that created such great products. Thanks for doing this it is great for everyone! We cannot wait to share more great companies and mom-preneuers with you!